Spirit of Boise Balloon Classic presented by CapEd Credit Union will take place from Wednesday August 29th through September 2nd, 2018 at Ann Morrison Park. Here's what you can expect from this year's event! Spirit of Boise Balloon Classic 2018 kicks off with Kids Day on Wednesday, August 29th. Hours may vary depending on weather, but it's scheduled to begin at 6:45 a.m. and continue until the balloons run low on air -- typically around 8:45 a.m. Kid's Day allows children to enjoy complimentary tethered rides aboard one of their favorite hot air balloons. In addition to free, tethered hot air balloon rides there will also be various activities for children available throughout Ann Morrison Park. Stop by before taking the kiddos to school! Lines do get long, so the earlier you can show up the better! Everyone is welcome on Thursday, our media day! Stop by to enjoy the first introduction day to the 2018 event! The festivities will kick off around 6:45 a.m. (weather depending) and should continue until 8:45 a.m.
Get your cameras ready! There's no better way to kick off a holiday weekend than by watching countless hot air balloons take to the sky! The Boise skyline will be filled with colorful hot air balloons as they see where the wind will take them. The event is weather dependent, but is scheduled to kick off around 6:45 a.m. and continue until the balloons land, sometime between 7:30 a.m. and 8:30 a.m. This once-a-year event is a MUST visit! Bring your loved ones, lawn chairs and blankets for a night at Ann Morrison Park watching the hot air balloons perform an epic nighttime glow show! The event is free and scheduled to run from 6 p.m. to 10 p.m. depending on weather. While guests of all ages are encouraged to attend, we do hope that you'll leave your fur animals at home, as noises that are undetectable to human hearing can cause extreme discomfort to pets. If you're looking for a reason to get your Saturday morning started early, this is it! 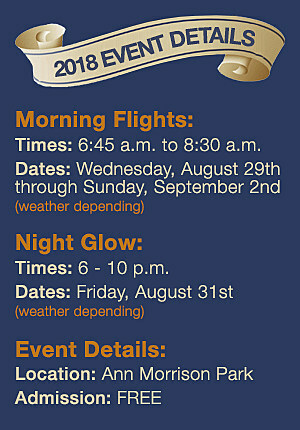 Stop by Ann Morrison Park between 6:45 a.m. and 8:30 a.m. for a morning hot air balloon take off! The view is spectacular and is a definite must-see. As always, this flight will be weather dependent with times that could vary. Rise and shine! The final day of the 2018 Spirit of Boise Balloon Classic includes morning flights and fun picture opportunities.